Cummins has introduced the new HSK78G natural gas generator series during the Middle East Electricity (MEE), at the Dubai World Trade Center (March 5 – 7), stand S3.D30. With a power density of up to 2,0 MW from a 78 L engine, displayed at the stand, the HSK78G series offers reliable power no matter how extreme the fuel source or operating conditions. This new series represents a bold step into the natural gas area for Cummins, showcasing new technology in a new engine that pushes new levels of efficiency, transient performance and gas variation well beyond former natural gas generators. 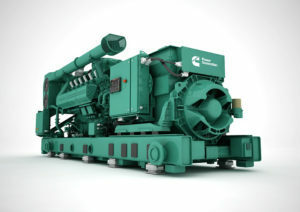 The HSK78G generator models are suitable for a diverse set of industries from mining to manufacturing, to shopping malls and hospitals, and have been designed to operate in extreme conditions while achieving a low total cost of ownership. They run cleaner whilst delivering a high electrical efficiency up to 44,2% at 50 Hz and 43,5% at 60 Hz on a wide range of pipeline natural gas down to 70 methane number (MN) without impacting power and efficiency output. The post New natural gas generator introduced appeared first on EE Publishers.